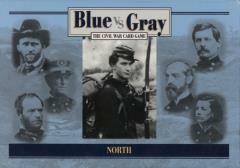 Blue vs. Gray is a card game covering the whole span of the civil war at the strategic level. Each side has its own deck of cards which includes leaders, units and special actions and events. Through the use of cards a map of the entire south slowly is revealed as the war progresses. Players have to manage their forces through an elaborate command structure while watching the expenditure of their supply. The entire game can be played in an evening and carried away in a player's pockets.